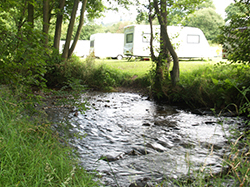 The Green Caravan Park is a family-run caravan and camping site situated in South Shropshire, set in the beautiful Onny valley between the Long Mynd and Stiperstones Hills in a designated Area of Outstanding Natural Beauty. The park covers 15 acres of land and is a haven of peace and tranquillity. This sheltered and level site has the small, shallow River East Onny running through. Children enjoy paddling and fishing in it; they also spend time in the play area where they can climb, walk over the wobbly bridge and have fun on the swings. 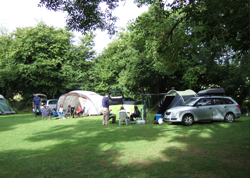 Seasonal electric pitches at The Green Caravan Park in Shropshire: £1040 including VAT. Permanent electric pitches at The Green Caravan Park in Shropshire: £1190 including VAT - the caravan stays on the pitch all year. Plus £3/night when the caravan is being used. Permanent Riverside non-electric pitches £930/year including VAT [no charge when using your van]. Monthly standing order payments can be made for seasonal pitches by arrangement. 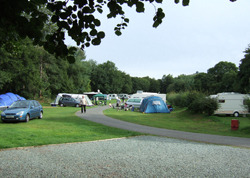 Seasonal pitches at The Green Caravan Park in Shropshire for shorter lengths of time are available by request. Please call Lin on 01588 650605 for further information. "Relaxing and peaceful site enjoyed by adults and children alike." "The site is kept in an environmentally friendly way. River clean, lots of trees, minimum of buildings. Bird spotting encouraged. Kids paradise." "We have come many times a year - for 21 years. The caravans in no way detract from the natural beauty and wildlife." "The park is an un-spoilt and natural habitat. Quiet and peaceful and very clean. Lots of wild flowers and grasses." "I enjoyed seeing the dippers in the river and the goats on the bank who kept us company. A beautiful, quiet spot and no litter."